If you are looking the best place to buy unsweetened freeze dried strawberries you have come to the right house—Harmony House. Our unsweetened dried strawberries, like all of our other premium freeze dried fruits, are made with no added sugar, colorings, or preservatives, and they are non-GMO and free of pesticides too. One pound of our delicious bulk freeze-dried strawberries equals 8 pounds of fresh fruit that you can store for up to 18 months in our BPA free containers. With fresh-freeze dried strawberries your family can enjoy the sweet red treat that is fun to eat, all year round! Keep some of our sliced unsweetened dried strawberries on hand for a quick and nutritious snack. A ¼ cup serving of our freeze dried strawberries is packed with over 10mg. of the antioxidant Vitamin C and almost 37mg. of Potassium. This nutritious berry also contains Vitamin A, Calcium, and Phosphorous. Read our Nutrition Fact Sheet on Freeze Dried Strawberries for more information. Our quart of our sliced bulk dried strawberries contains four cups of premium dried fruit so you’ll be able to get a lot of snacks out of a single jar. You can make delicious strawberry pies, tarts, and cakes with freeze dried strawberries. 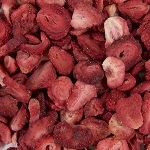 Simply add one cup of water to one cup of bulk dried strawberries to rehydrate for cooking. Our freeze-dried strawberry powder bulk can intensify the fruit flavor in any of your favorite recipes and be used in place of artificial flavorings. Both sliced and powdered freeze dried strawberries rehydrate instantly when added to smoothies with milk or yogurt. For restaurants, caterers, cafeterias, large families, or anyone else cooking for a crowd, we sell our freeze-dried strawberries in bulk. If you have any questions about cooking with strawberries or want to place an order, please give us a call at 1 (800) 696-1395.